20-page booklet. For agents with smaller employers. 100-copy minimum. 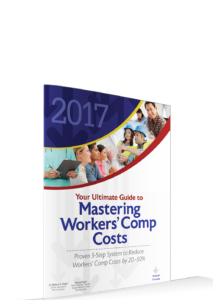 The Pocket-Size Mini-Book version (5″ x 7″) of Your Ultimate Guide to Mastering Workers’ Compensation is a great way to leave behind a “business card” that will become an important reference tool for recipients. The Pocket-Size Mini-Book contains all of the information in the Mini-Book presented in a half-size package to make it convenient to carry in a pocket, purse, or portfolio. To help your company’s branding efforts, we can create custom covers with your company logo when you purchase this package of 100 Pocket-Size Mini-Books. When we receive your order, we will contact you to discuss your cover design preference. You can purchase a single copy of this Pocket-Size Mini-Book to see how much valuable information is contained in this edition and how much of a positive impression you can create by distributing this handy reference tool to clients and business associates.